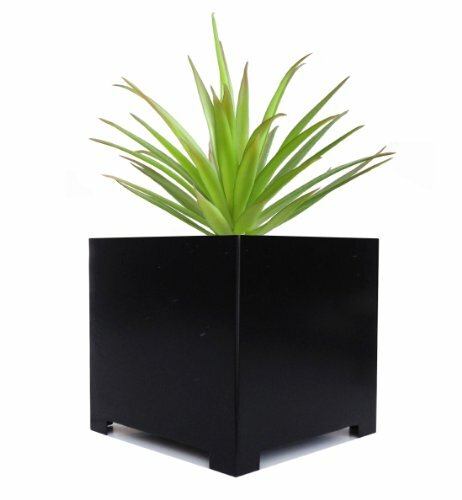 Alora Cube Planter - XL - Black - 23" x 23" x 23"
A favorite of outdoor landscapers and interior designers alike, this sturdy cube planter proves that it is indeed hip to be square. With a sleek design, hand-constructed from recycled 16 gauge sheet-metal steel, this solid indoor/outdoor planter combines modern sophistication with old school craftsmanship. Powder coated finish with a 1" drainage hole on bottom. Large size - 23" x 23" x 23" - Great for large plants and miniature trees! Color: 23" x 23" x 23"
Brushed Stainless Steel Planter - 18" diam. x 18" ht. Keyhole 4' x 4' Compost Garden Bed, Made with Vinyl, Ensure That Easy to Use and Easy to Clean, Compost is Rich in Nutrients That's Perfect for Plants.